Even in those places where snow may still be on the ground, gardening is in the forefront of people’s minds. Daffodils are popping up, loquat trees are fruiting, and the March winds are blowing in the April showers. April is a month of many things: Earth Day (4/22), National Poetry Month, Kids Gardening Month, and Kite Flying Month to name a few. To keep your April chock full of nature fun, I created a round-up to keep you and yours creatively connecting all month long! 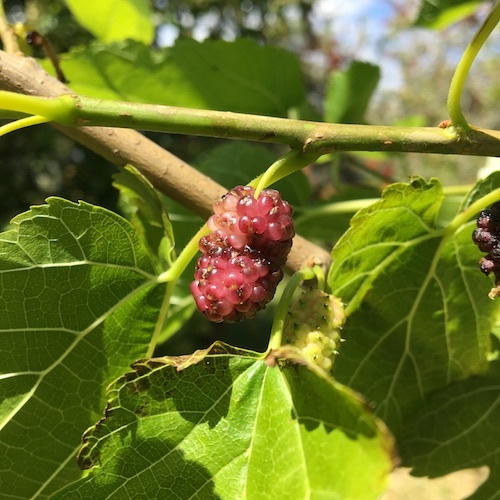 The birds and I are loving the abundance of mulberries on the Florida trees this month. I’ve never been great at writing (or reading for that matter) poetry myself, but I do really like writing simple nature poetry with children. Try your hand at garden and spring nature inspired poetry with these activities! Fear Poetry? I Challenge You! – Make an acrostic poem – this is great activity for the poetry averse (like me if I’m honest) or for doing with young children or in groups. April Shapes Up for Poetry – Learn to make poetry in the shape of the nature you’re writing about. 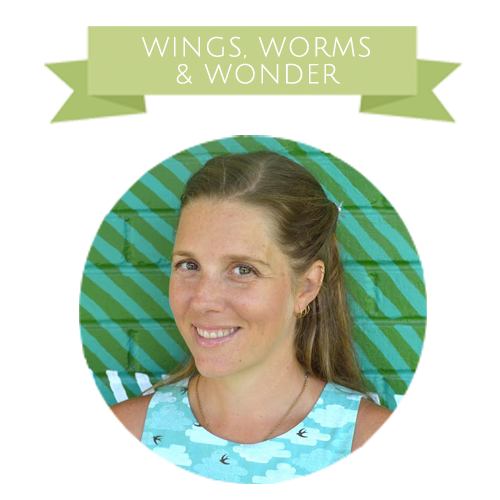 Wonder Wednesday 56: Found Nature Poetry – Cut up words gathered on nature walks and reassemble them into a poem. This activity has a pdf for you to make your word tickets too! 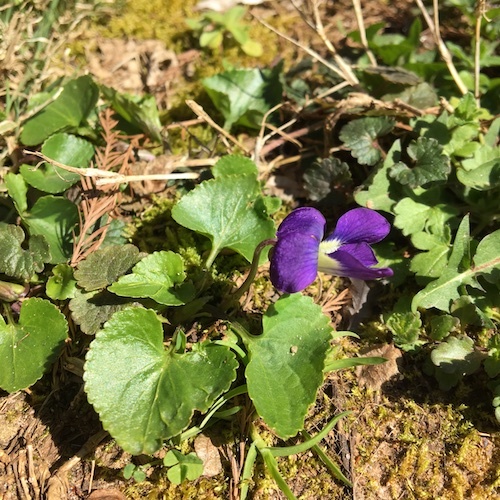 Wild violets are an early sign of spring and are popping up everywhere in Virginia. Join the Kid’s Grow Contest! 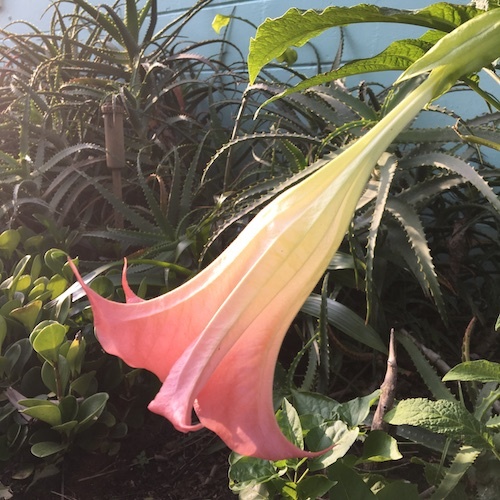 Open to children ages 0-18, submit visual art, recordings of music, videos, photography, or creative writing illustration what grows in their gardens. Each week Kid’sGardening.org will choose an entry to receive a prize and 2 grand prize winners will be chosen at the end of the month. Learn more and get the submission details here. 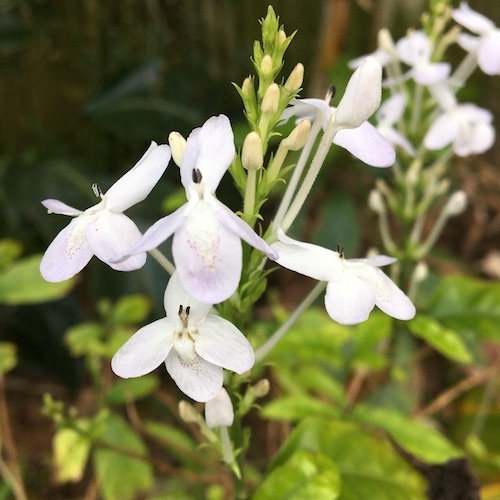 Vietnamese spinach is blooming in my Florida garden. Earth Day is Monday April 22 this year and can be fun, but also be a guilt trip in its own way. This year, make it about celebrating the little natural wonders we discover right outside our doors. 10 Ways Not to Save Anything for Earth Day – “Let them love nature before we ask them to save it” David Sobel, need I say more? Celebrate Earth Day with a Tree Ceremony – Celebrate the trees that offer us shade, fresh air, fruits, medicines, act as climbing hideaways, and a serve as beautiful backdrop to our lives! 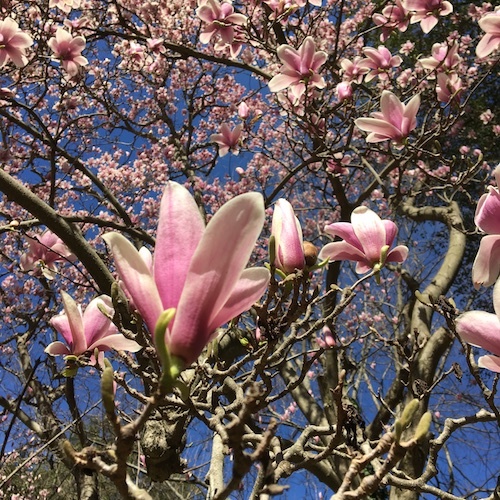 I especially love to climb the Japanese Magnolia trees when they are in bloom. To encourage gardening at home and school, on tiny scales and large, I’m having a sale on online gardening consultations purchased during the month of April! Online consults will be $50 off through April 30! Yahoo! Click here to learn more about what a Garden Consultation includes. Click here to contact me to organize an online Garden Consultation with you! 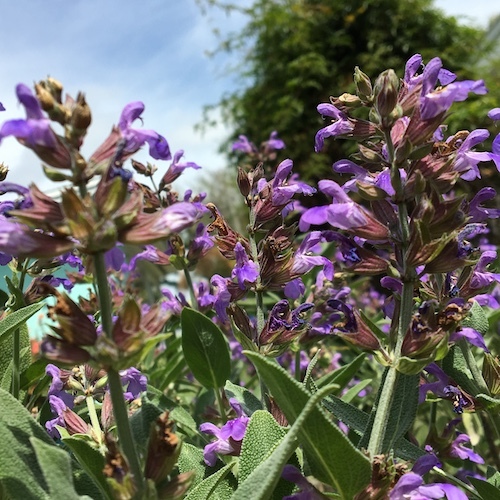 Sage blooms abound in my garden this month! Did you see last month’s Wonder Wednesday activity “Go Fly a Kite”? It teaches you how to make your own little kite and find a kite flying festival near you! Check it out here. 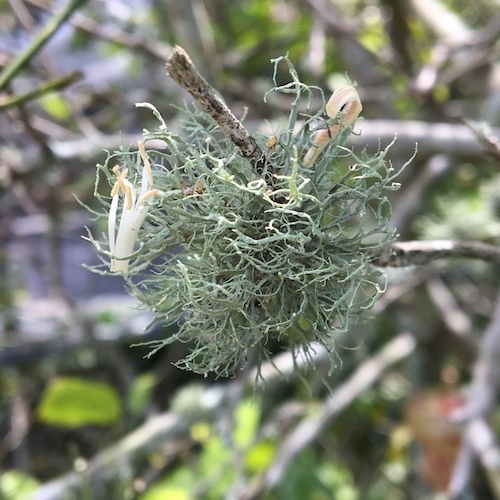 The spring wind blew the stamen of a citrus bloom right into a bundle of lichen in the lemon tree. I hope these ideas and photos get you inspired to get out and discover the whispers nature has waiting for you. 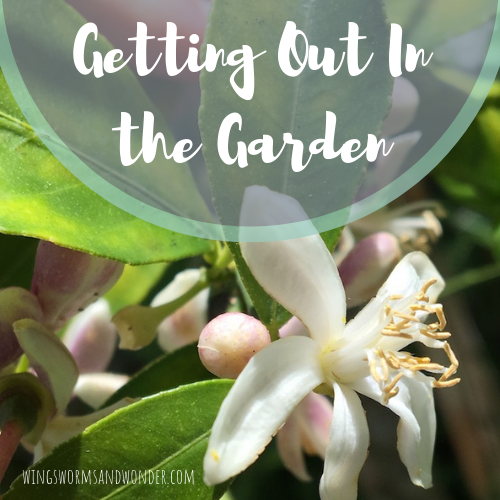 And if the time is right, I’d love to help you get your garden growing this spring. No space is too small, too urban, or too lacking “green thumbs”, I promise! You can grow some fresh veggies no matter where you live. I would love to help! What would you most love to do in nature this spring? Share in the comments below! Share pics of your spring fun on Instagram #wingswormsandwonder! Spring Events – I have lots coming up – including the Spring Bada-Bing in Richmond this weekend (4/13). Check out all my upcoming events here. This is the first belladonna bloom of the season in my garden.